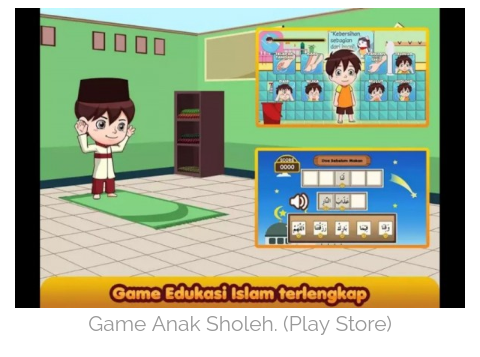 At this time, comes many games for kids that offers a variety of content and educational mini games, one of them is Indonesian game called "Anak Sholeh" by Agate team. Adapted from antaranews.com, co-founder of Agate Studio, Wiradeva Arif Kristawarman, said that this game presents the Islamic values in an entertaining story. There is the introduction of letters hijaiyah, daily prayer, surah, prayer tutorial, the story of prophets and other Islamic knowledge. "In the application has available content and integrated, safe for children because there is no ads, there is no negative content, while playing can learn and involves parents with their limited time ," said Arif. this game presents the content mini game, the story, ensklopedia, parent menu, adventure, achievement and target-aged children 7-10 years. Arif said, this game centered on the story of cat named Muza which has a mission to save the origin place that have been damaged. "Muza requires the essence of goodness realized with goodness card. There's adventure comprising 30 episodes and divided into six theme. Teach children to be good is not enough only once, the most important process is continuous, learn something new," said Deva. Anak Sholeh Game currently has played by around 30.000 users.